Earlier this summer, aquarists Austin Brayton and Jackie Anderson camped on a remote island in Maine to assist with Project Puffin, an Audubon Society project designed to restore populations of these clownish little seabirds. In this post, Austin takes us on surveys for terns on Seal Island. 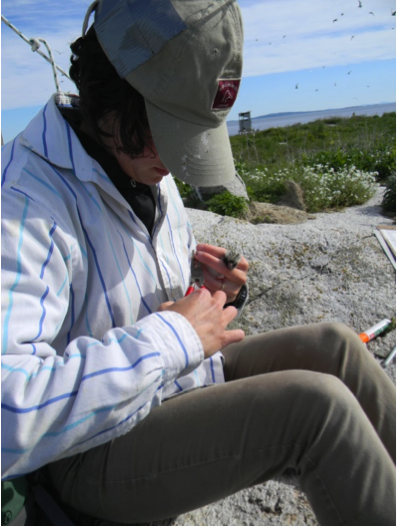 Jackie and I helped gather data for two major tern studies: tern productivity and a tern feeding study. 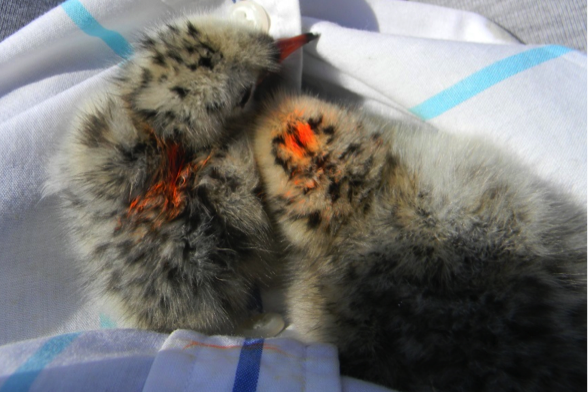 The tern productivity study involves monitoring the growth and survival of tern chicks in specific study plots. The nests are checked daily and chicks are banded shortly after they hatch so that you can keep track of individuals. These chicks are then weighed and measured every other day. 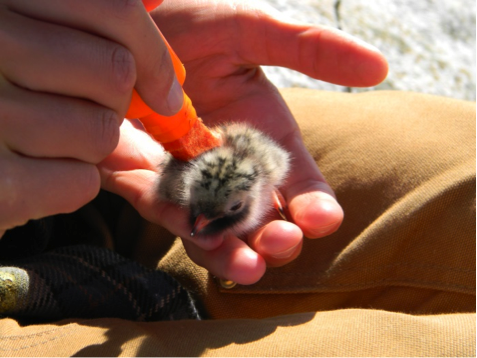 The tern feeding study involves observing specific nests from a blind within the colony and identifying and counting the food items (small fish and shrimp) that are fed to the chicks by the parents. Chicks from the nests being observed are marked with non-toxic ink in order to identify them. It was fascinating to observe the terns during the feeding study. Each pair that I observed had a slightly different method of chick-rearing. Some pairs seemed to take turns going out to fish while in other pairs one parent remained at the nest while the other fished. There was also lots of drama – terns squabbling over territory and even killing neighboring chicks, and chasing away “teaser” males that would come into the colony showing off a fish they had caught in order to attract females. 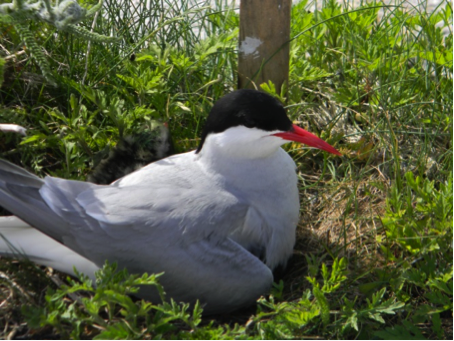 Data from both the productivity and the feeding studies will be used to monitor how changes in the environment, such as from climate change, overfishing or increases in predators like gulls, impact the health of the tern colony.